The model example of military university collaborative research is the inception, design, and creation of the atomic bomb. Conceived and developed by University of California, the creation of the most deadly device ever made was a product of research funded by the military and conducted by an elite group of America's university scientists, professors and graduate students. Since the Los Alamos Laboratory opened its doors in 1943, every single nuclear weapon built for the United States arsenal was designed at a University of California managed weapons laboratory. The history of the development of Los Alamos and the second National Laboratory, Lawrence Livermore laid the foundation for the last fifty years of military research and development conducted on America's college campuses. 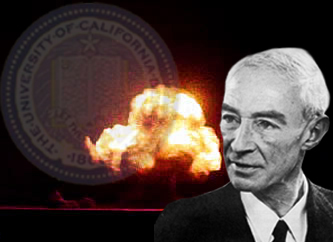 In the spring of 1942, Robert Oppenheimer, later dubbed the father of the atomic bomb, was asked by University of Chicago physicist Arthur Holly Compton to work with him on studying the feasiblity of producing a nuclear weapon. With studies under way on the manufacture of Plutonium and Uranium, both scientists eagerly researched ways in which a superbomb could be created. In June of that same year, Oppenheimer organized a summer study at his university, UC Berkeley. Attendees included Compton from the Metallurgical Laboratory at the University of Chicago, graduate student Robert Serber of the University of Illinois, and several physics theorists including Edward Teller. The June 1942 meeting at UCB provided the theoretical basis for the design of the atomic bomb, which was to become the principal task at Los Alamos during the war. Upon discovery that the production of a nuclear bomb was possible, the scientists still had questions they need answered, instruments necessary for production, and a full-time staff consisting of Americas most advanced scientists, many of whom were prestigious faculty of some of the nations public research institutions. The LANLs website details the need for a laboratory dedicated to nuclear research: By September 1942, the difficulties involved with conducting preliminary studies on nuclear weapons at universities scattered throughout the country indicated the need for a laboratory dedicated solely to that purpose. (1) Theoretical studies were well underway up until this point, but a laboratory dedicated to production, research, design, and testing was soon underway, under command of General Leslie Groves, who was deputy to the chief of construction for the Army Corps of Engineers during construction of the Pentagon. The Manhattan District of the Corps of Engineers (MED), taking over work on production of the Laboratory from the OSRD, sealed the deal on April 15, 1943 when the University of California Regents signed a contract to manage the Labs, a contract that has remained intact for six decades. General Groves was intent on a military takeover of the institution down the road, but many scientists were vigorously supportive of University management for credibility and access to top scientists. At least one scientist, the head of the physics division at Los Alamos issued a letter of resignation that would be effective upon the transition of the labs from the UC to the military. The Atomic Energy Commission, created in 1947, was formed to oversee nuclear weapons research, development, production, and testing; production of plutonium and weapons grade uranium; milling and refining of uranium ore; biomedical research into the effects of radiation and nuclear weapons; basic nuclear research in fields such as chemistry, physics, and metallurgy; development of nuclear reactors; and promotion of a civilian nuclear power industry.3 Since its inception, which was a direct result of the creation of the national nuclear laboratories, the AEC has been responsible for funding and oversight of the management of the labs by the UC. In 1975, the AEC became a part of the Department of Energy, with whom the UC is now contracted in the management of both LANL and LLNL. In 1952 UC founded the second national weapons laboratory, Lawrence Livermore located in the East Bay, transferring many research scientists from the UC Berkeley Radiation Laboratory for increased work on nuclear weapons. It was believed that the creation of a second laboratory would instigate a rivalry between scientists at both labs, creating an atmosphere of competition that would spur technological discoveries, and would fuel a US advantage in the arms race. The budget for 2004 from the DOE for total weapons activities will be 6.4 billion dollars, an increase of 9% from 2003. 7 This is 30% of the entire annual DOE budget of $21 billion. The $6.4 billion is distributed by the semiautonomous National Nuclear Security Administration, primarily to the three national nuclear labs in the United States: LANL, LLNL, and Sandia National Laboratory in New Mexico which is managed by the Lockheed Martin Corporation. The Los Alamos Laboratory will recieve 1.3 billion dollars for weapons research, Lawrence Livermore will receive 1.2 billion. (6) That means that this year, of the $4 billion dollar combined budget the University of California manages for the labs, $2.5 billion, or 63% will be used for nuclear weapons research. The $2.5 billion is spent on various nuclear weapons programs, including the Stockpile Stewardship Program, which provides for upgrades of every nuclear weapon the US has, and the development of new nuclear weapons, under the guise of stabilizing an already existing arsenal of weaponry. The goal of the SSP is to enhance the capabilities of the US nuclear weapons stockpile. In that pursuit, NNSA is modifying, altering, refurbishing, performing life extensions on, and replacing life components in all of the weapons in the stockpile.6 Though a huge portion of the DOEs budget is devoted to these weapons improvement programs, the budget contains very little information about them. Also being researched by University of California employees is the Robust Nuclear Earth Penetrator, with a $45 million budget over three years for design and theoretical framework. Construction of the RNEP is set to begin in the spring or summer of 2003 at LANL, and it will be the first new nuclear weapon to be added to the US arsenal since 1989. It has been touted as a more useable nuclear weapon, its objective to burrow hundreds of feet below the ground before detonation in a bunker-busting technique. Not only does preliminary research prove the RNEP ineffective, but it shows that if used in an urban setting, the radiation emitted, though underground, would be enough to kill 50,000 people in the first 24 hours. Bush Administration rhetoric has been heavily saturated with threats of first-strike nuclear use, and the development of a new nuclear weapon designed for battlefield use has disastrous consequences in the international arms control regime. The research of weapons of mass destruction including the RNEP, the management of the Stockpile Stewardship Program, and the disposal of nuclear waste, are all fundamental responsibilities of the University of California as lab managers. Under the guise of fundamental scientific research, backed by one of the nations most respected institutes of higher learning, laboratory scientists and bureaucrats are able to continue their legacy of building weapons of mass destruction by abusing the reputation of this university, its faculty, and its students. In 1984, three professors from UCSC decided to take a stand against the UC management of the weapons labs. BIll Matthews (Astronomy), Barry McLaughlin (Psychology), and Dane Archer (Sociology) set out to sever the ties between the UC and Los Alamos and Livermore labs by proposing a resolution at the Faculty Senate meeting, which passed almost unanimously. Later that year, the resolution was picked up by the Academic Senates on every other UC campus--and ALL the campuses voted to sever ties. Unfortunately, this did not impress the regents who extended the contract which is again up for renewal in 2005. Because the University of California played such an integral role in the formation of the partnership between Americas institutes of higher learning and the military, it is now the responsibility of the UC to disarm our society by disarming our universities. The creation of the nuclear weapons laboratories, and the continued management of these factories of destruction by the University of California sets a precedent to other institutions, faculty, and most importantly the impressionable student body that military science is not only important, but somehow ethical and necessary. download, copy, print and distribute!